Way to go, Martin! Despite life’s chores (why do we have to have jobs?) 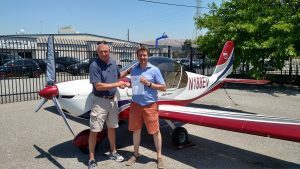 getting in the way of scheduling, Martin put in the effort to complete his Sport Pilot certification with instructor Jason. His checkride with Scott including have the FAA sit in during the oral portion. Talk about pressure! But Martin handled it like a champ and earned his license on the first attempt. We are so happy for him! Congrats on all the hard work and have fun trolling the skies in the light, fun Evektor SportStar. Tags: California flying, checkride, Evektor, LSA, Pilot license, reid-hillview, San Jose, sport pilot, SportStar.